Nineteen-year-old Mattapan resident Iran Gray was fatally shot outside the Rhythm and Spice bar and nightclub on Massachusetts Avenue in Cambridge at approximately 1:45 a.m. Friday morning. 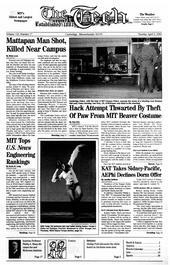 MIT s mascot Tim the Beaver lost a foot on Saint Patrick s Day during a hack attempt gone awry. Class of 2004 Ring Committee member Amal Dorai 04 and several other MIT students brought the Institute s beaver mascot costume to Harvard Square, where the paw was stolen by an unknown male. Members of the Kappa Alpha Theta sorority will move into the new graduate student dormitory at Sidney and Pacific Streets next fall. At an informal information session yesterday afternoon, Institute Professor and Nobel Laureate Phillip A. Sharp unveiled his vision as director of the McGovern Institute for Brain Research.